Objective Deficiency in the cytosolic DNA sensor RNA Polymerase III (POL III) was recently described in children with severe varicella-zoster virus (VZV) infection in the CNS or lungs. Here, we describe a pair of monozygotic female twins, who both experienced severe recurrent CNS vasculitis caused by VZV reactivation. The clinical presentation and findings included recurrent episodes of headache, dizziness, and neurologic deficits, CSF with pleocytosis and intrathecal VZV antibody production, and MRI of the brain showing ischemic lesions. Methods We performed whole-exome sequencing and identified a rare mutation in the POL III subunit POLR3F. Subsequently, antiviral responses in patient peripheral blood mononuclear cells (PBMCs) were examined and compared with healthy controls. Results The identified R50W POLR3F mutation is predicted by bioinformatics to be damaging, and when tested in functional assays, patient PBMCs exhibited impaired antiviral and inflammatory responses to the POL III agonist poly(dA:dT) and increased viral replication compared with controls. Conclusions Altogether, these cases add genetic and immunologic evidence to the novel association between defects in sensing of AT-rich DNA present in the VZV genome and increased susceptibility to severe manifestations of VZV infection in the CNS in humans. Here, we describe 2 monozygotic twins with similar clinical presentations, suggesting recurrent CNS vasculitis caused by VZV reactivation. Genetic and functional immunologic analyses were performed to examine a possible genetic and pathophysiologic basis of the clinical phenotype. The patient and her twin sister were admitted for clinical immunologic evaluation. See supplementary medical history for further clinical details. A total of 84 mL of blood was drawn from each patient. Four milliliters of blood was used for DNA-isolation and subsequent whole-exome sequencing (WES), whereas the remaining 80 mL was used for isolation of peripheral blood mononuclear cells (PBMCs), performed using SepMate tubes (Stemcell Technologies, Vancouver, BC, Canada) with Ficoll-Paque (GE Healthcare Life Sciences, Chicago, IL), and cells were then stored in liquid nitrogen. Control PBMCs were obtained from healthy controls after written consent. DNA was isolated from ethylenediaminetetraacetic acid (EDTA)-stabilized blood using EZ1 DNA Blood 350 μL Kit and an EZ1 Advanced XL instrument (Qiagen, Hilden, Germany) according to the manufacturer's instructions. See supplementary methods for description of WES data analysis. PBMCs from patients and controls were thawed in 50-mL tubes containing 15 mL of preheated media (RPMI-1,640 w/L-glutamin [Biowest, Riverside, MO]) supplemented with 10% heat-inactivated fetal bovine serum (Biowest) and 1% penicillin/streptomycin and spun down at 350 g for 8 minutes. The PBMCs were resuspended in media and divided into 24-well plates at a concentration of 5 × 105 cells per 300 μL media per well. Next, cells were incubated overnight at 37°C in an atmosphere of 5% CO2. The cells were subsequently transfected using Lipofectamine 3000 at 0.75 μL/μg DNA (Invitrogen by Thermo Fischer Scientific, Waltham, MA) and Opti-MEM (Gibco, by Life Technologies, Carlsbad, CA), by the TLR3-agonist Poly(I:C) [2 μg/mL] or transfected with the POL III agonist poly(dA:dT) [2 μg/mL] [Cayla, Invivogen, San Diego, CA]). Cells were incubated for 6 hours before harvest and cell lysis. For virus experiments, PBMCs were infected with VZV-infected MeWo cells (ROka strain) (PBMC:MeWo-VZV ratio, 1:1). One vial of VZV-infected MeWo cells was thawed, spun down at 1,000 rpm for 10 minutes, and resuspended in 400 μL preheated media. From this solution, 30 μL was added to the wells to be stimulated with VZV. Cells were incubated for 6 hours, except VZV, which was incubated with PBMCs for 48 hours before cells lysis and RNA harvest. The stimulations were performed in triplicates, and each experiment was performed 2–3 times. RNA was purified from PBMC whole-cell lysates, as per the manufacturer's instructions, using the High Pure RNA Isolation Kit (Roche, Basel, Switzerland). Before cDNA synthesis, VZV-infected PBMCs underwent DNAse treatment and removal step (Turbo-DNA-free Kit, Thermo Fischer Scientific, Watlham, MA). From the isolated RNA, cDNA was synthesized using the QuantiTect Reverse Transcription Kit (Qiagen, Hilden, Germany) following the manufacturer's instructions. The synthesized cDNA was subsequently used for real-time quantitative PCR using TaqMan probes, allowing amplification and analysis of levels of IFNB1, TNFA, the interferon (IFN)-stimulated gene CXCL10, and the viral VZV gene ORF63. TBP was used as housekeeper gene for reference. All analyses were performed as technical duplicates for all samples, and the TaqMan probes (Thermo Fischer Scientific, Waltham, MA) used were IFNB1: Hs01077958; TNFA: Hs01113624; and CXCL10: Hs01124251. For analysis of ORF63, which was performed separately, SYBR Green was used for ORF63 (LGC Biosearch Technologies, Petaluma, CA). The Mann-Whitney rank-sum t-test was used to determine statistical significance; nonsignificant (ns); *p ≤ 0.05; **p ≤ 0.001. The project was approved by the Regional Ethics Committee (#1-10-72-275-15), and the patients provided informed written consent before blood sampling. All data published may be shared at the request of other investigators. A 37-year-old woman (P1) was referred to the international center for immunodeficiency diseases for clinical immunologic evaluation based on recurrent stroke-like manifestations diagnosed in the neurologic department as presumed CNS vasculitis caused by VZV reactivation. The first episode occurred at age 25 years when she experienced an episode of left-sided hemiparesis and headache. CT of the brain demonstrated two infarcts in the right temporal region and 2 minor ones in the cerebellum. Eight years later, she was readmitted with right-sided hemiparesis, and –paresthesias double vision and impaired balance, and CT again revealed a 4-mm infarction. Neurologic symptoms including headache, dizziness, and paresthesias of the left arm and leg developed 1 year later, leading to another hospital admission. MRI demonstrated a lacunar infarction in the right subcortical temporal region. A subsequent lumbar puncture revealed mild pleocytosis of 7 × 109 cells/L and an elevated index for intrathecal VZV IgG antibodies with negative intrathecal herpes simplex virus (HSV) index, negative PCR for HSV-1/2, VZV, and enterovirus and negative bacterial cultures from the CSF (table 1). Sarcoidosis, MS, and systemic vasculitis were excluded by blood tests, MRI, and angiography, respectively. The patient was treated with acyclovir 10 mg/kg tds for 14 days together with corticosteroids (prednisolone 50 mg once daily for 10 days) because the clinical presentation was interpreted as CNS vasculitis. The identical twin sister (P2) experienced a very similar medical history with the first episode at the age of 35 years, including right-sided paresthesias followed after 6 months by another episode of right-sided paresthesias involving upper and lower extremities and the face. Lumbar puncture demonstrated a mild pleocytosis of 10 × 109 cells/L and positive intrathecal test for VZV, although no virus, neither HSV-1/2 nor VZV was detected by PCR. MRI of the total medulla and brain demonstrated myelitis at the level of C6 and Th2 (figure 1A) and signs of paraventricular parietal cerebral ischemic lesions on the left side with several small juxtacortical lesions bilaterally (figure 1, B and C). Another episode occurred 6 months later with reoccurrence of VZV intrathecal IgG antibodies (positive VZV IgG index in CSF) leading to a presumed diagnosis of VZV vasculitis. Finally, both sisters were reported to have had a normal course of primary VZV infection (chickenpox) in childhood at almost the same time. Moreover, they did not report any increased susceptibility to other viral, bacterial, or fungal infections, neither in the past nor at present. According to Danish health recommendations, neither of the sisters were vaccinated against VZV. (A) MRI of the medulla (sagittal STIR sequence) demonstrating ischemic lesions/myelitis at the level of C6 and Th2. (B and C) MRI of the brain (3D FLAIR sequence) in (B) coronal and (C) transverse projection demonstrating a parietal paraventricular lesion on the left side. Red arrows indicate lesions in the medulla and brain. Because of this unusual presentation in both monozygotic twin sisters, we suspected a genetic etiology of the recurrent VZV CNS vasculitis. A routine clinical immunologic evaluation was normal, including normal immunoglobulins, lymphocyte distribution and proliferation within the normal range, and a negative HIV test. We therefore performed WES on DNA from P1, which resulted in the identification of a novel missense mutation in the POLR3F subunit of the cytosolic DNA sensor RNA Polymerase III (POL III) (figure 2A). 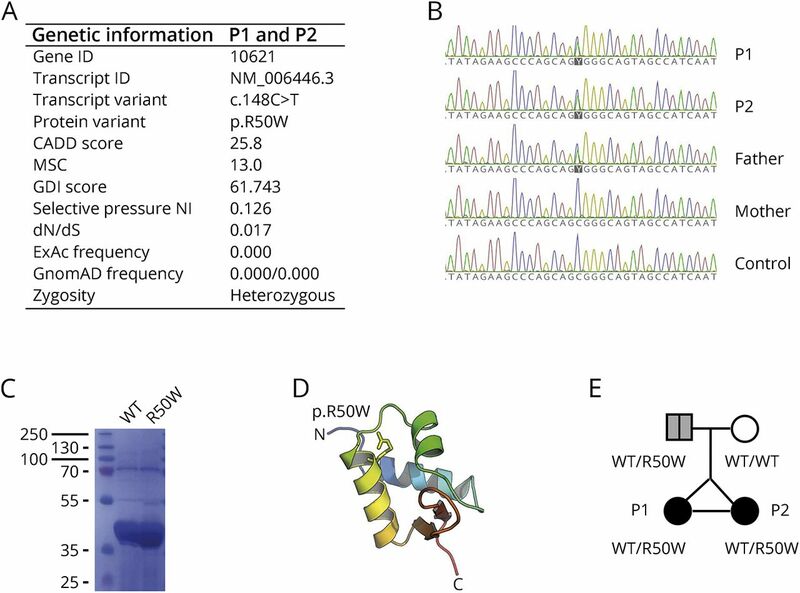 The mutation, R50W POLR3F, is rare and predicted to be damaging by bioinformatics software, such as PolyPhen-2 and SIFT and with a high combined annotation dependent depletion (CADD) score of 25.8, which is well above the mutation significance cutoff score of 13.0 for this gene.4,5 Further population genetic analyses, based on study of POLR3F variations from the GnomAD database, demonstrate a lower frequency of nonsynonymous and loss-of-function mutations with a CADD score >12, and a global minor allele frequency <10−4 for nonsense mutations. Moreover, when performing natural selection assessment based on mouse and human gene homologous comparison, the POLR3F gene appears to be under purifying selection as reflected by a dN/dS score of 0.0172 below the threshold of 1. Finally, there is a selective pressure neutrality index of 0.126, predicting moderate purifying selection (figure 2A and figure e-1, links.lww.com/NXI/A73). (A) Summary of genetic information on the identified variant in POLR3F. (B) Sanger sequencing of P1, P2, their parents, and a control, with the POLR3F variant c.148C>T present in P1, P2, and the father. (C) Coomassie blue staining of SDS-PAGE revealing similar solubility of wild-type POLR3F and mutant R50W POLR3F expressed from Escherichia coli. (D) Molecular model of POLR3F first winged helix domain based on the Protein Data Bank ID 2DK8 with the R50 shown as sticks. (E) Pedigree showing the affected monozygotic twins with the R50W POLR3F variant inherited in a heterozygous manner from the father with possible previous VZV CNS disease. CADD = combined annotation dependent depletion; dN/dS = ratio of non-synonymous to synonymous substitutions; GDI = gene damage index; MSC = mutation significance cutoff; NI = neutrality index. The identified POLR3F variant (NM_001282526.1 c.25C>T, p.R50W) causes an amino acid shift from the positively charged arginine (R) to a bulky aromatic tryptophan (W) in the N-terminal region of the POLR3F subunit, which together with POLR3C and POLR3G constitutes a POLR3 subcomplex essential for POLR3 promoter transcription initiation(figure 2, A and D). As expected, the same POLR3F variant was found by Sanger sequencing to be present in the monozygotic twin sister. The mutation was inherited from the father (figure 2B), who was previously admitted to hospital with clinical signs and symptoms of stroke, which retrospectively might have been linked to VZV CNS vasculitis; however, this was not examined at the time. Biochemical analyses demonstrated that expression and solubility of the mutant POLR3F protein were unaltered compared with wild type, suggesting that the R50W mutation affects protein function, such as ligand recognition or enzymatic conversion of the adenosine-thymidine–rich DNA ligand into 5′ triphosphorylated RNA, rather than expression of the POLR3F protein (figure 2C). Two additional rare gene variants with a high CADD score identified through the WES analysis are listed in table e-2 (links.lww.com/NXI/A74); however, none of these were judged to be of any relevance for the infectious phenotype of these patients. Next, we investigated in vitro antiviral and inflammatory responses in P1 to VZV infection and the POL III agonist poly(dA:dT), the latter being a constituent of the AT-rich VZV genome (figure 3). As shown, PBMCs from P1 showed significantly impaired IFNβ−, TNFα−, and CXCL10 responses to poly(dA:dT) (figure 3, A–C). By contrast, responses to transfected Poly(I:C) were normal as expected because this ligand activates the cytosolic RNA receptor Retinoic acid-inducible-I (RIG-I) directly downstream of POL III (figure 3, D–F). 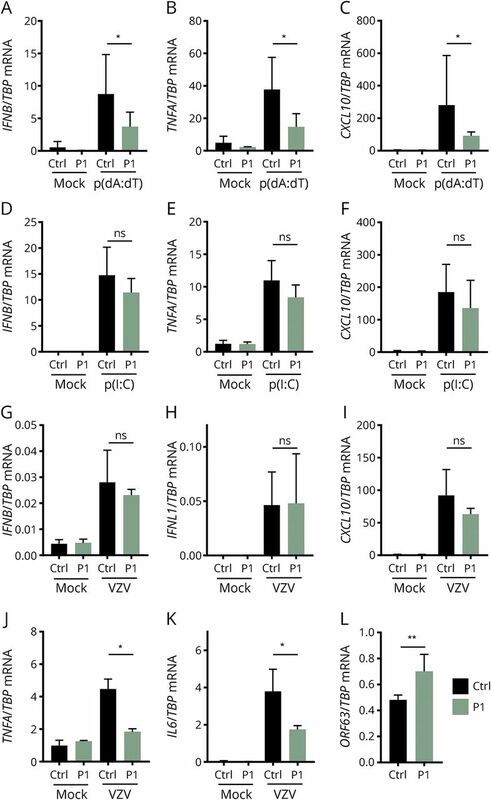 Moreover, we observed significantly impaired production of the 2 proinflammatory cytokines TNFα and IL6 in response to VZV infection of PBMCs from P1 and controls (figure 3, J and K), although IFNβ, IFNλ, and CXCL10 responses were comparable between P1 and controls (figure 3, G–I). It is important to note that on VZV infection, a significantly increased amount of the viral immediate-early gene ORF63 mRNA was detected in P1 cells relative to controls, demonstrating increased viral replication, i.e., reduced viral control in patient cells (figure 3L). Taken together, these results demonstrate impaired immune responses to the POL III ligand poly(dA:dT) and impaired proinflammatory responses to VZV in the setting of increased VZV replication in patient cells. PBMCs from P1 and 9 healthy controls were used for experiments. (A–C) PBMCs were transfected with poly(dA:dT) (2 μg/mL) for 6 hours. (D–F) PBMCs were transfected with poly(I:C) (2 μg/mL) for 6 hours. (G–K) VZV-infected MeWo cells were cocultured with PBMCs for 48 hours. Total RNA was isolated for measurement of mRNA for the indicated cytokines by reverse transcription-qPCR. (L), VZV replication was assessed by measuring the viral transcript ORF63. Cytokine levels and ORF63 levels were normalized to TBP and compared with pooled results of 9 healthy controls. Data are shown as column bars, and error bars represent SD. The nonparametric Mann-Whitney rank-sum test was used to evaluate statistical significance between groups. Significance level *p < 0.05 and **p < 0.001. mRNA = messenger RNA; PBMC = peripheral blood mononuclear cell. The cases described here are notable for the occurrence of an extremely rare disease presentation suggestive of CNS vasculitis caused by recurrent VZV reactivation in monozygotic twins. The clinical history consisting of recurrent neurologic deficits presenting in a stroke-like manner with headache, hemiparesis, pleocytosis, and elevated VZV IgG levels in CSF and white matter lesions detected on brain MRI are all in agreement with VZV vasculitis in the CNS. However, this diagnosis is rather difficult to make with certainty, and even MR angiography is only suggestive and not a conclusive evidence of this diagnosis. Moreover, histopathologic evidence of vasculitis in the CNS could not be provided in the 2 cases described here. In a case series of 14 adults with cerebral vasculitis, it was reported that positive intrathecal anti-VZV IgG combined with relevant neurologic symptoms and imaging was a definite marker of this disease rather than VZV DNA detection by PCR because the latter was positive in only 4 of the patients.13 In this respect, the absence of detectable VZV by PCR in CSF is not surprising and is consistent with VZV CNS meningoencephalitis, including vasculitis.2 It is important to note that both patients described in the present study have a good clinical response to acyclovir and corticosteroid treatment during clinical episodes but experience recurrence of symptoms and new MRI lesions during discontinuation of acyclovir. There is clearly a different pathogenesis between classic VZV meningoencephalitis and the presence of vasculitis developing in some cases of VZV CNS infection.1 At the cellular level, increased viral replication, which for VZV is known to also include endothelial cells within the CNS, may evoke enhanced inflammatory responses secondary to the presence of virus and thereby explain the occurrence of vasculitis and immunopathology in these patients1. In summary, we describe 2 female monozygotic twins both experiencing recurrent stroke-like episodes associated with VZV reactivation in the CSF diagnosed as presumed CNS vasculitis, in whom we identified a heterozygous missense mutation in the POLR3F subunit of the cytosolic DNA sensor POL III, resulting in impaired antiviral responses and increased VZV replication in patient PBMCs compared with controls. Since then, both P1 and P2 receive prophylactic acyclovir treatment, and notably, P1 has repeatedly experienced symptoms and new white matter lesions when interrupting prophylaxis. We propose that impaired sensing of AT-rich DNA in the VZV genome contributes to increased susceptibility to the rare condition of VZV-induced CNS vasculitis, thereby extending the spectrum of CNS manifestations linked to POL III deficiency. Altogether, this case adds further genetic and immunologic evidence to the novel association between defects in DNA sensing and increased susceptibility to severe manifestations of VZV infection in the CNS in humans. T.H. Mogensen, C.S. Larsen, and J.-L. Casanova conceived the idea. T.H. Mogensen and C.S. Larsen identified the patients. M.E. Carter-Timofte, A.F. Hansen, and S. Fribourg performed experiments. MCT, A.F. Hansen, M. Mardahl, F. Rapaport, S.-Y. Zhang, T.H. Mongensen, S.R. Paludan, and M. Christiansen analyzed data. T.H. Mogensen wrote the first version of the manuscript. All authors read and approved the final version of the manuscript. M.E. Carter-Timofte, A.F. Hansen, M. Mardahl, and S. Fribourg report no disclosures. F. Rapaport received research support from Shapiro-Silverberg Fund for the Advancement of Translational Research. S.-Y. Zhang served on the editorial board of Frontiers in Immunology. J.-L. Casanova served as editor of Proceedings of the National Academy of Sciences of the United States of America, Journal of Experimental Medicine, Current Opinion in Pediatrics, Current Opinion in Immunology, and Journal of Medical Genetics; served as Deputy Editor-in-Chief for Clinical Immunology; served as an editorial board member of Philosophical Transactions of the Royal Society; consulted for Genentech, Nimbus, Vitae, Sanofi, and Pfizer; and received research support from Biogen Idec, NIH/DHHS/National Vaccine Program Office, Howard Hughes Medical Institute, and Qatar National Research Fund. S.R. Paludan and M. Christiansen report no disclosures. C.S. Larsen served on the editorial board of Travel Medicine and Infectious Diseases. T.H. Mogensen reports no disclosures. Full disclosure form information provided by the authors is available with the full text of this article at Neurology.org/NN. Previously published at bioRxiv doi: 10.1101/244848. Received by Neurology: Neuroimmunology & Neuroinflammation April 18, 2018. Accepted in final form July 18, 2018. The authors thank all patients involved in this study. T.H. Mogensen is funded by The Independent Research Fund Denmark (4004-00047B) and Aarhus University Research Fund (AUFF-E-2015-FLS-66). A.F. Hansen received funding from the Faculty of Health, Aarhus University. The Ph.D. scholarship to MCT is funded by the European Union under the Horizon 2020 research and innovation program (H2020) and Marie Skłodowska-Curie Actions–Innovative Training Networks Programme MSCA-ITN GA 675278 EDGE (Training Network providing cutting-EDGE knowlEDGE on Herpes Virology and Immunology). S. Fribourg is funded by INSERM. Finally the authors thank consultant Anette Loft Edal from the Department of Radiology, University Hospital Lillebælt, Kolding, Denmark, for preparing the MR images. Accepted in final form July 18, 2018.
. Varicella zoster virus vasculopathies: diverse clinical manifestations, laboratory features, pathogenesis, and treatment. Lancet Neurol 2009;8:731–740.
. The protean manifestations of varicella-zoster virus vasculopathy. J Neurovirol 2002;8(suppl 2):75–79.
. Varicella zoster virus infection. Nat Rev Dis Primers 2015;1:15016.
. The mutation significance cutoff: gene-level thresholds for variant predictions. Nat Methods 2016;13:109–110.
. Varicella zoster virus immunity: a primer. J Infect 2015;71(suppl 1):S47–S53.
. Inborn errors in RNA polymerase III underlie severe varicella zoster virus infections. J Clin Invest 2017;127:3543–3556.
. RIG-I-dependent sensing of poly(dA:dT) through the induction of an RNA polymerase III-transcribed RNA intermediate. Nat Immunol 2009;10:1065–1072.
. RNA polymerase III detects cytosolic DNA and induces type I interferons through the RIG-I pathway. Cell 2009;138:576–591.
. TLR3 mutations in adult patients with herpes simplex virus and varicella-zoster virus encephalitis. J Infect Dis 2017;215:1430–1434.
. Mutations of POLR3A encoding a catalytic subunit of RNA polymerase Pol III cause a recessive hypomyelinating leukodystrophy. Am J Hum Genet 2011;89:415–423.
. Recessive mutations in POLR3B, encoding the second largest subunit of Pol III, cause a rare hypomyelinating leukodystrophy. Am J Hum Genet 2011;89:652–655.
. The value of detecting anti-VZV IgG antibody in CSF to diagnose VZV vasculopathy. Neurology 2007;68:1069–1073.